Direct vent gas fireplace with traditional log set. For a compact, elegant fireplace perfect for entertaining, the TRF41 is a perfect fit. It is a direct vent fireplace that can be installed easily in almost any space. 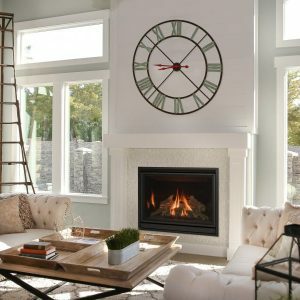 Its uniquely slim shape allows it to be installed in almost any room, serving as an accent and functional heater rated fireplace. 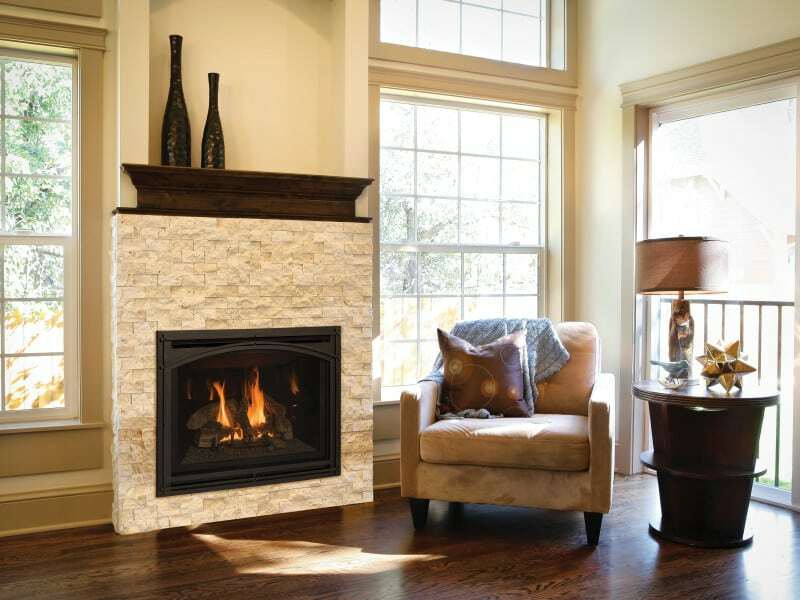 The TRF41 is a direct vent gas fireplace. 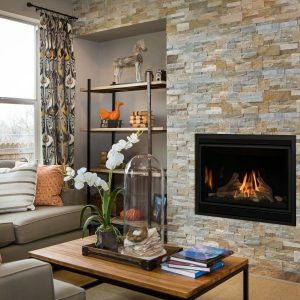 Each of our fireplaces complies with Canada’s EnerGuide energy performance with Natural Gas Rating of 66.89% and a LP Gas Rating of 67.64%. Along with a high performance energy rating, and with a Natural Gas of 28,500 BTU per hour input for the IPI fireplaces & 28,000 BTU per hour input for the Millivolt fireplaces and a LP Gas of 28,500 BTU per hour input for the IPI fireplaces & 28,000 BTU per hour input for the Millivolt fireplaces – has your fireplace consuming less energy and returns a higher output. The included Komfort Kontrol remote allows you to use our green zone heating technology by setting the preferred temperature for the room. 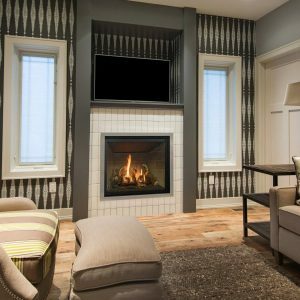 In this way, you and your family can be comfortable in the rooms that you use most with your high efficiency fireplace, and not worry about heating the rest of the house – in turn, saving you money. The TRF41 contemporary direct vent gas fireplace. 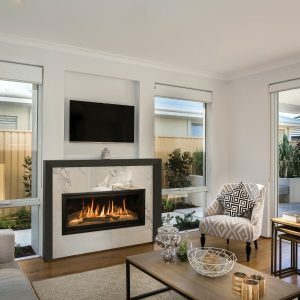 The TRF41 is a natural gas or liquid propane fireplace that has a sealed combustion chamber that draws air from outside the home and exhausts the fumes from the fire out the chimney cap creating a clean enjoyable fire. 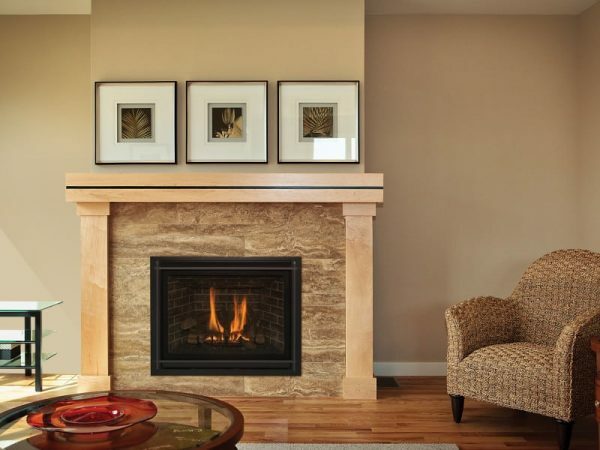 This type of fireplace does not require an existing fireplace or chase to be present, as the pipe can run horizontal out the house or vertically through the roof as long as clearances are maintained.